Remove meat from duck and discard bones. Slice meat and skin into bite-sized pieces about 1 inch (2.5 cm). Trim away root end of scallions, then cut scallions into 1-1/4-inch (3-cm) lengths. Using a sharp knife or kitchen shears, cut a fringe in end of each scallion. Place scallion brushes in a bowl of ice water (scallions will curl in ice water). Place carrots in bowl of ice water with scallions. Chill until ready to serve. Warm tortillas in a microwave oven for 1 minute or wrapped in aluminum foil in a 275 degrees F. (140 degrees C/Gas 1) oven for 10 minutes. Using kitchen shears, cut tortillas into 3/4-inch by 4-inch (2-cm by 10-cm) strips. Working in batches, place tortilla strips on work surface. Top each strip with a small amount of duck, 1 scallion curl, 4 to 5 carrot pieces and a dash of hoisin sauce. Roll up and secure with a toothpick. 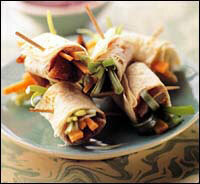 Serve with hoisin sauce for dipping. Prepare duck, scallions and carrots 2 hours ahead. Assemble just before serving.